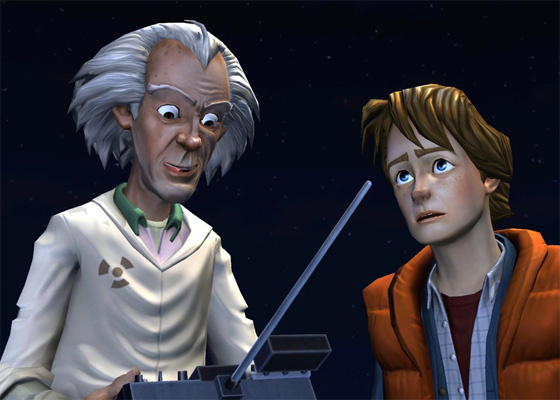 Telltale Games' homage to classic 1980s movie series Back to the Future is coming to Europe, courtesy of Deep Silver. Back to the Future: The Game will release on Wii in the first quarter of this year, with the original English language voice overs intact. It'll also feature German voice and subtitles or French subtitles. 2nd February 2012 - Hampshire, UK/... Deep Silver today announced a publishing agreement with Telltale, Inc. for the retail edition of Back to the Future : The Game. Deep Silver receives the exclusive rights to publish and distribute the retail version of the game in the EMEA territories. The game was developed through a publishing agreement with Universal Partnerships & Licensing. The phenomenally popular Back to the Future films literally changed the future of the adventure movie genre. Now, Telltale has developed a graphic adventure game that tells a fresh new time-travelling story where players will meet all the familiar characters that they’ve grown so fond of. Back to the Future : The Game brings the iconic 'Marty McFly', 'Doc Brown' and the DeLorean Time Machine together in a completely new cinematic adventure. Six months after the events of the third film, the DeLorean Time Machine mysteriously returns to Hill Valley. 'Marty' must go back in time and recruit aid from a resistant teenage 'Emmett Brown', or else the space-time continuum will be forever unraveled. Back to the Future : The Game features the likenesses of the original stars that made the characters of 'Marty McFly' and 'Doc Brown' legendary: Michael J. Fox and Christopher Lloyd. Lloyd is voicing 'Doc Brown' in the English version. 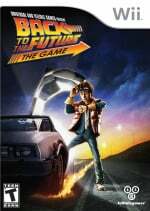 Back to the Future : The Game will be released by Deep Silver for the PlayStation®3, for Wii™ and in some territories also for Windows PC. The game will be available in the following languages: English and German text and voice and in French (text only). The retail edition of Back to the Future: The Game will not be released “OUTATIME” but in the first quarter of 2012. Was afraid this wouldn't get here, I will surely pick it up, the good outweighs the bad in this one IMO. I think I read in a game magazine that there's ridiculous slow down on the Wii version of the game. Caution to anyone who is going to get this. Why would you make a game about this? "I don't dance very well when my partner has a gun in his hand." OMG I forgot this game came out on the Wii. I have the first episode on PSN. Good game, but I hope people know that TellTale engines barely run on Wii - and really aren't that much better on any other consoles. Still no word on Jurassic Park Wii? Still waiting for Sam & Max Season 3 too. "We may have to blast!" Great Scott! Its over 1.21 Gigawatts!!!! The only true film game adaption. "Wait a minute, Doc,.. Are you telling me,... you made a time-machine,... out of a DeLorean?" "The way I see it, if you're gonna build a time-machine into a car, why not do it with some style?" I still think the character designs for this are a bit odd. "You mean you have to use your haaaaands?! That's a kid's game!" Wild Gunman scene in BTTF part 2. So that's how's it hanging. A part of me is glad it's coming, the other part would rather have waited for a release on the WiiU or maybe 3DSwithout all the flaws the Telltale games have on the Wii. The Telltale games / characters just fit Ninty consoles perfectly though imo. As would the good ol' LucasArts adventures. What the hell's a Gigawatt? "You're not thinking fourth dimensionally!" "Right, right. I have a real problem with that." never saw the movie, want to though. Hmm this could be really good or really bad. not diggin the animation style here. it makes marty look too much like hiccup from 'how to train your dragon'. also, my favorite line in part iii when marty says "great scott!" and doc brown says "this could get heavy!" This game was amazing, just finished it recently. Given the performance of Resident Evil: Revelations on 3DS, surely the architecture for the handheld is suitable for BTFF also, give or take some visual quality? lol @25....You Neve saw it? What are you waiting for? They are some of the greatest movies ever. If my calculations are correct, when this baby hits 88 miles per hour... you're gonna see some serious slowdown on the Wii. Or so I've read. I played BTTF: The Game on the PC. If im McFly That Makes You Biff ! Id give this game a try just cause ima 80's baby/fan ! I missed that it ever came out here at all. I'll have to go pick it up. I played the first episode on my computer and it was pretty fun. And while i haven't played this one yet i think there is a lot of potential for more seasons. Getting to know the characters when they were babies, in primary school, in a retirement home, in different eras, ... (Be it themselves, ancestors or descendants of 'em). Which also makes me want Day of the Tentacle or a sequel on a Ninty once again.